Say cheese! Photo modes have been popping up in all sorts of video games recently, most notably with the release of Super Mario Odyssey and Assassin’s Creed Origins last week, and why shouldn’t they be? Players have long been attempting to capture their greatest gaming achievements through improvised means for years (usually resulting in a blurry shot of the TV screen from a mobile phone), so the addition of a robust and accessible in-game photo mode is a much appreciated accessory, especially now that sharing your favourite pics on social media is easier than ever. Every new game in the making should consider whether it could be improved with a photo mode and, considering the answer to that question is almost always yes, such titles could learn a thing or two from the following 10 examples, which have produced some of the best versions of the selfie-snapping feature yet. Dead Rising 4 wasn’t good for much, but credit where credit is due to Capcom Vancouver for creating a delightful photo mode to lift up an otherwise utterly average game. Capturing the brutalities and hilarities of the apocalypse through a Kodak lens has always been a big part of the zombie slaying franchise, but Frank West’s latest shopping trip brings a thoroughly modern twist to the mechanic. Not only can Frank earn points for cramming as much gory action into the photo frame as possible, but he can even pull his enemies into a headlock to take an entirely non-consensual selfie with someone who’d much rather be eating his brains out for dinner. Make sure you ignore Dead Rising 4’s mundane attempts to imitate serious photojournalism, and go have fun making supermodels out of the undead instead. GTA 5, Rockstar’s open world magnum opus, was one of the first of its kind to introduce the in-game phone camera to players, and it’s remained the one to beat ever since. Using Michael’s, Franklin’s, or Trevor’s own unique cell phone to quickly grab a cheeky selfie is easy thanks to Rockstar’s intuitive design, and the mode boasts healthy customization options for facial expressions, frames, filters, and more. In single-player, it’s hilarious to see how Los Santos’ denizens react to your unexpected camera flashes, but the feature really comes into its own in Grand Theft Auto Online, where you can shoot your own stunts, Jackass style, with friends. It’s unclear why Monolith Studios ditched its photo mode for Middle-earth: Shadow of Mordor’s recently released sequel, Shadow of War, but it’s a real shame, as the former lets players immortalize some orc-tastic memories for the mantelpiece. Shadow of Mordor’s roaming camera is surprisingly robust, too, allowing you to play around with tilt, depth of field, framing, texture overlays, logos, and filters to create the most aesthetically pleasing Mordor moment you could ask for. Talion’s the brooding type, so he isn’t exactly a great source of creative inspiration for the budding photographer but, luckily, the orcs - along with their buckets of blood and frequently flying limbs - provide more than enough material for a scrapbook’s worth of pics. One of the very first studios to get in on the photo mode trend was Sucker Punch in 2014, when inFamous: Second Son was updated with a fully fledged photography feature that could be deployed at almost any moment during your adventures as Delsin Rowe or Abigail Walker. Second Son is a very pretty game, and it knows it, as its in-game camera is rigged up with a suite of photoshopping tools to accentuate all those lighting and particle effects crackling across the TV screen. 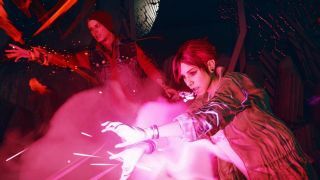 The mode makes for an especially delicious treat when playing as Fetch in Second Son’s standalone expansion, inFamous First Light, as the character’s neon powers look just as dazzling in stasis as they do in motion. I’ve already put at least fifteen hours into Assassin’s Creed Origins, and I’m pretty sure at least eight of those were spent trying to take a perfectly timed leap of faith selfie off the Alexandria Lighthouse. It’s not so much Origins’ photo mode itself that’s praiseworthy, then, but rather the beauty of the historic setting which motivates all that trigger happy snapping in the first place. Not only is Ancient Egypt an endlessly inspiring muse for the camera, but Bayek’s vertical freedom as a parkour professional allows you to capture some stupendous vistas and dazzling action shots from all sorts of preposterous angles. Plus, it’s all integrated brilliantly through Ubisoft’s in-game version of Assassin’s Creed Instagram, where bringing up the map allows you to admire and ‘like’ the best snaps of the day from other artistically minded players around the world. It’s no secret that practically every frame of Super Mario Odyssey is a jubilant jambalaya of rampant happiness, so of course the game’s photo mode is a welcome addition for documenting the plumber’s latest adventure. For some reason, the game never actually tells you about the existence of its supported photography feature upfront, but the mode is available to enjoy right from the get go, with a simple press of the Switch’s D-Pad. The options to decorate your snaps with stickers and filters aren’t massively extensive, but it doesn’t matter, because even the pre-altered shots of Mario being Mario are usually barmy enough as it is. It’s not unnatural for a racing game to look almost photo-realistic as a result of the technical horsepower running beneath its bonnet, which makes photo mode an ideal addition for an experience as drop dead gorgeous as last year’s Forza Horizon 3. The fact that you’ll always be switching between an incomprehensible selection of cars ensures that no one picture will ever be the same, especially as Playground Games’ amazing recreation of Australia is such a wide and varied racing sandbox. There’s some wholesome in-depth tools for photo optimization too, including the ability to tinker with pitch, yaw, roll, altitude, and zoom, all on a free form camera that can be whipped out at any time as you drive across the plains of the outback. The best thing about Super Smash Bros Wii U’s in-game camera is the opportunities it presents for competitive manipulation. The gambit of suddenly pausing the game in the middle of an intense showdown is a risky one, but it’s worth it just to see how your friend deals with the unexpected freeze frame amidst all the mayhem. Better yet, if you’re fighting well, why not zoom in and grab some humiliating shots to prove your brawling superiority once and for all, just in case they start making excuses once the match is over. That’s what friends are for, right? Oh, Nathan, you really are a poser. No matter what the wise-cracking explorer is up to when you enter photo mode in Uncharted 4, he always manages to look fabulous. It helps that the lush, detail-rich environments around Nathan look stupendously pretty too, and the game even lets you play paparazzi during the cutscenes, which can lead to some... interesting scenarios. Experiment with the healthy range of customization tools, and you can create some proper bizarre pieces of art, as exemplified by the slightly disturbing image above. I think this one symbolises Nate’s tendency to stroke his own ego, don’t you? Look, just because you live in a post-post-apocalypse filled with raging mecha-dinos and savage tribes doesn’t mean you can’t take an Insta-worthy self-portrait when the lighting is just right. And boy, is the lighting almost always just right in Horizon Zero Dawn. After noticing that players would spend hours just standing around and soaking up all the beauty of its rebirthed earth, Guerrilla Games eventually added in a photo mode to its acclaimed open world IP, complete with a variety of adorable poses that Aloy can pull off to express herself with style. In a game where every frame could be a painting, even the most amateur lensman will be able to find beauty through Horizon’s camera. Just make sure there isn’t a moody Thunderjaw wandering nearby when you’re smiling and posing away.